It is always a good idea to do away with metals in catalysis as in organocatalysis. In a new strategy Uyanik et al. (DOI) use catalytic amounts of an ammonium hypoiodite (R4N+IO-) in an oxidative Cycloetherification. 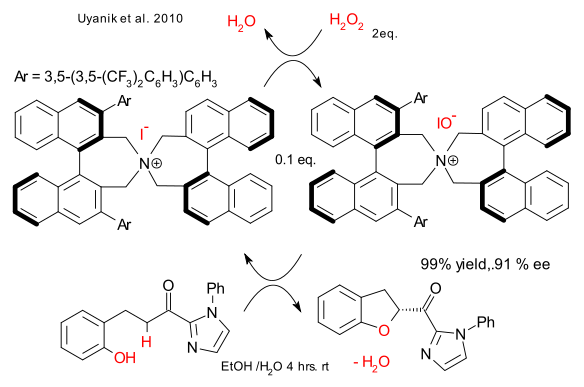 The hypoiodite is continuously regenerated from stoichiometric hydrogen peroxide as sacrificial catalyst and the only by-product is water. The ammonium ion is chiral and based on the BINOL framework making the reaction asymmetric. Not that the road towards this result was easy: for the initial screening of a m-CPBA / iodobenzene system a messy yield is reported (frank but not very scientific description), the chiral catalyst has to be huge (Ar = 3,5-(3,5-(CF3)2C6H3)C6H3) in order to be stereo selective (common issue in asymmetric synthesis) and the reaction will not work unless the imidazoline group is present (for anchoring the hypiodite group) further reducing the reaction scope.